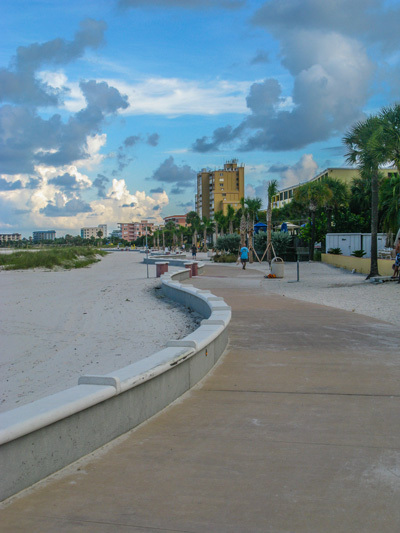 A humid morning beach run is pretty typical on the Gulf Beaches from July to September. However, short interval workouts enhance belly fat loss...so that's how I normally run during this time of year. Since I workout at CrossFit St Pete, I only run twice a week (Wednesdays and Sundays) and I do not push too hard. Running on the beach, especially if it is high-tide, is nothing like chasing a bunch of other guys around a track during an interval workout. You have to stay focused on where your feet will hit next because the surface is so uneven. Fortunately, here on Treasure Island Beach, the tide was just starting to go out, so I had a narrow shelf of hard-packed sand at the top of the waterline. The main thing I had to contend with was the weather. Even though it was about 7:00am, right at sunrise, I could see there was a storm building out in the Gulf. To the south, there were huge black clouds. I figured Bradenton and Sarasota were already getting hit, this morning. I had no idea how long (or short) of a time until the storm made its usual turn north, so I headed out to the south. 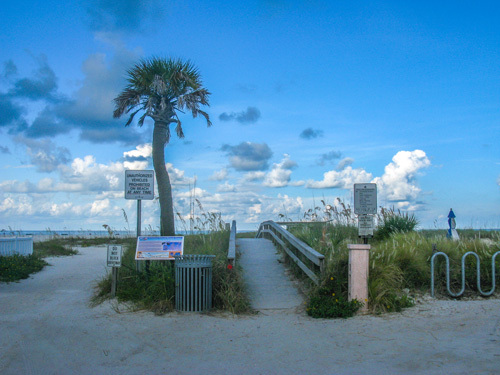 I thought it was best to keep an eye on things and I would run toward the Middle Jetty instead of north, to John's Pass. 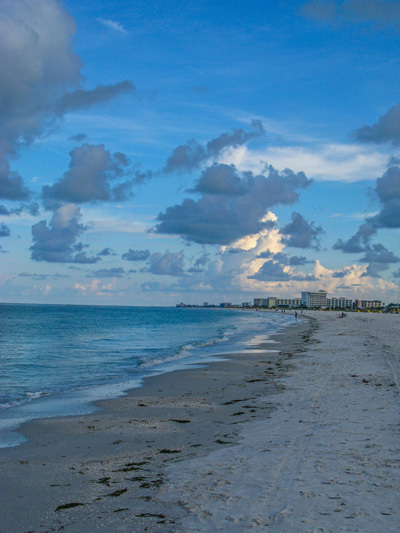 Staying hydrated is primary when you are running in warm, humid weather, like is found on the Florida beaches in summer. I always make sure to down a 16 oz bottle of water before I leave for the beach, then another once I get there. Also, I plan a definite amount of time to train. Today, the main part of my workout was 6 x 3-minute intervals, with 90 seconds rest in-between. I try to keep the intensity part to 30 minutes. Add a half-mile, slow warm-up, and some stretching, and it is about another 12 minutes...then a cool-down jog to the showers adds another four to five minutes. If I hold it to less than an hour, I'm pretty good. Some guys (who are younger) just run for an hour straight, and carry water with them...but that has always been a hassle for me. Plus, I train to enhance fat loss and increase lean muscle, so I am more focused on "burst training." * Guys can go shirtless. * Wear shoes that provide great support. They may be heavier, but it is worth it. * Know where water/restrooms are available along your route. * When you feel the wind increase noticeably, it means a storm is real close. * Understand your times on beach sand will be slower than on an asphalt track. * Try to run at low-tide. 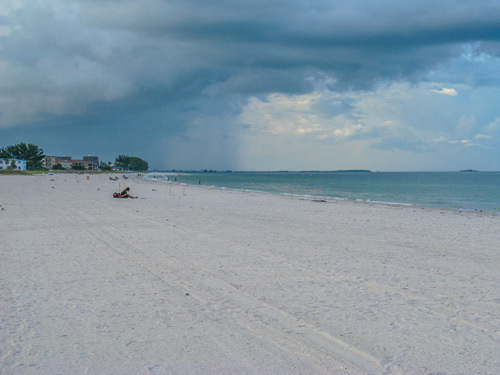 Looking north, toward John's Pass/Sunshine Beach looked very inviting. It was the beginning of low-tide, and the early morning white clouds were beautiful. You could barely tell a storm was in the air. To the south, however, was a different story. There were some foreboding black clouds, and I could tell it was already raining down by the Sunshine Skyway Bridge. 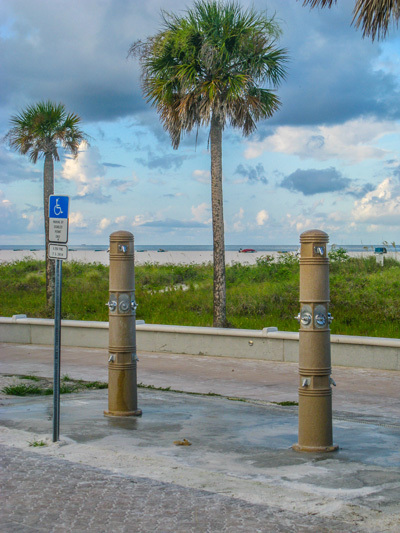 The showers at Gulf Front Park, 104th Avenue and Gulf Blvd on Treasure Island, are always a welcome sight after a humid morning beach run. The showers are right on the Treasure Island Beach Trail. This wide-paved path offers a faster surface for interval training. The curves are real gentle. You can pretty much run a straight line. The total length is less than a mile (.85 miles). The Trail gets a lot of foot-traffic and bikes. It is best if you get out here at first light, about 30 minutes before sunrise. 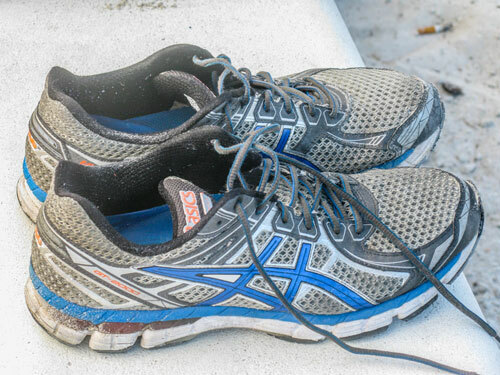 My Asics GT 2000 series shoes are the best I have found for beach running. They have tremendous support and stability. Plus, they rinse out real easily. I feel like the most fortunate retired guy in America. Every day, I wake up to a scenic location, great weather, and an unhurried lifestyle. 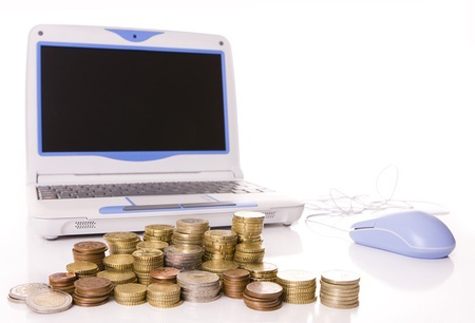 One of the blessings that has helped me so much has been the continual expansion of my online home business. I found SiteSell/Suite Build It back in 2006 when I first retired. Since then, it has been the source of a lot of extra income. Truthfully, I am not one of those Internet millionaires, but I am on my way. Not spectacular, but it allows me plenty of travel, concert tickets, eating out, and staying in nice resorts. I know a lot of guys who make money online would snicker, but I can stretch an extra 7 Grand a long ways. Plus, because I have an online home business, and I have a couple of travel sites, almost all of my expenses are legal tax write-offs. Here are a couple of links to mornings I had, last week. When you have your own home business, you can really have a nice retirement lifestyle. I hope your own training is going well...that you are getting more lean, losing belly fat, and becoming more muscular. Truthfully, 90 percent of it is diet, that's why the guys I train with (at CrossFit and here on the beach) adhere to a Primal/Paleo lifestyle. Eating natural foods is definitely the way to go. It would be nice to see you out here, one day. Humid morning beach runs take a while to get used to, but you can do it.